A ring pop will be analogous to a dum dum in the way in which Spencer will be able to handle and/or consume it. The middle of January began the "new semester" at The Little Gym. Many of the same people were there, but there were also a lot of new people. I'm horrible at guessing numbers, so this following statement means little to nothing, but I'd say there were probably three times as many people there than there usually are. You know what I'm going to say next, right? Spencer did not react well. He wasn't bad, per se. He was just super active. And it is winter, and he doesn't get to go outside very often, so I would never qualify his activeness as "bad;" it's just, what's a good word? It's awesome--in the purest sense of the word. It inspires in you a sense of awe. I had not bargained on there being so many new people in addition to all of the regulars, so, in my naivete, I tried to take his pacifier away as he was on his way into the gym. I asked if he'd put it in his bag, if I could hold it for him. We'd already discussed leaving it in the car, to which he gave me a resounding and negative response. But, usually, once the fun gets going, he's cool being paci-less. So, his teacher, "Miss Erin" yanked it from his little mouth and handed it to me as he ran into the gym. I'm not sure if it was that she took it away or that it appeared to him that I wasn't coming in to the gym with him or that all of that happened as he simultaneously realized there were a bunch of strangers in the room, but he had a little fit. And by little, I mean big. All the moms who've been around him all fall are so sweet. They are not judgmental; they believe you are doing the best you can; their kid is totally different from yours and you both affirm that there is equal and amazing value in them all. But I could feel the stares from all the new moms. And I'm sure they are also just as understanding and kind (at least most of them probably are, lol! ), but their poor little children are in a brand new, huge gym, which could be overwhelming to some toddlers (it never was to Spencer, by the way), and I just kept thinking, "Just smile, and act calm. Raise your eyebrows. Distract him. He'll settle down. Don't give the paci back, it'll just reinforce this behavior (you know, behavior any and every human naturally displays from time to time when their comfort is ripped from them just as their expectations for the day are broadly swept aside)." But he didn't stop. Malin's (the "a" is like the "a" in "mail"--isn't it a cute name?) mom and I had an entire conversation about how they didn't give Malin her paci the other night before bed, and she never asked for it or missed it, so they're done with it. But she can tell that probably won't work for Spencer. (lol! probably not!) She said he's probably more of a "paci party" kid. He'd probably do better when he could understand why he couldn't have it anymore, etc. And as we discuss this paci-quasi-philosophy, he was still screaming. I made a few last-ditch efforts at "redirecting" his energy, but he must have felt my resolve dwindling because he just got louder. Finally, I decided this was not the time or the place for a battle of the wills over his paci. Or maybe it was the time and the place, and I admitted defeat. I'm cool with either rendition. Many, many other little children were starting to look down-right upset because of the adorable, screaming little boy in their class. What must his mommy have done to him? I asked him if he could say "Paci please," and he said "Peeese." And immediately dried it up. I left the gym to get his paci and returned to a sweet little boy awaiting his security object. He immediately received it; and then, he was off. It was as if, on this particular Wednesday morning, his pacifier had given him strength--or maybe endurance would be a better word. He ran, climbed, swung, and pulled me places non-stop. One of the new mom's complimented the utter adorable-ness of his curls (you know, once people could hear people well enough to actually have conversations since Spencer had stopped screaming). I told her they were his saving grace. "Miss Erin" laughed and agreed. He did his skills with "Miss Erin," but otherwise he was outta there. He was obsessed with standing on the bars like a balance beam. I was helping him do front and back hip circles and the kind with one leg over the bar (I can't remember what those are called). He was jumping from the bar onto the ground. I can't even remember much more besides being jealous of the mom's who've been coming as long as I have, standing on the side of the mat talking to each other while their children were playing happily in the gym without their input or assistance. There is a mat wrapped around the water fountain and a two-door closet that is perpetually unlocked--both of which Spencer knows are off limits. He went down both of those paths today. And he hadn't messed with those things in so long. I'd totally underestimated the power of things being a "little" bit different to totally sabotage all of Spencer's "progress" in class. He was (not surprisingly) begging for his milk by the end of the class. He wouldn't go get in line (or the blob of children) to get a stamp. So, we just walked out. And as soon as we did, it was like the clock had struck midnight, but in a good way. He walked directly where I told him to go. He sat down as soon as I asked. He drank his milk as I put on his socks and shoes. He said good bye to "Miss Erin." And the whole gymnasium breathed a sigh of relief as we walked out. Towards the end of the class hour-long session of crazy, a sweet mom who has known Spencer since August told me that her oldest daughter could not handle being over-stimulated, and that now, even at eighteen, she is still like that. At first I was so thankful for her encouraging words (not automatically assuming I'm some half-brain-dead mom who can't calm, comfort, or control her own child but instead seeing Spencer and his needs in the broader context of all the differences that were at work today), but now that I'm reflecting, I wonder what this means for his (and my) future. Then we went to get my allergy shot, where I decided it was the day to fight the battle over whether or not we stand in the chairs at the doctors' office. I think the earlier paci defeat gave me new resolve. I won, but it wasn't pretty. The night of the Sugar Bowl, I could not get over the behavior I witnessed from Spencer. In the forefront of my mind swirled images of his less-than-joyous reactions to many of the "new" people and schedule amendments throughout our Christmas rounds. I fully expected him to behave basically the same way towards all of the guests that would be dropping by his Gigi and Papa's house to watch the game. Instead, he reinforced my slowly-learned "clarity statement" that I should employ any and every time I enter a room with my Spencer--expect the unexpected. Had he not been identical in appearance, weight, speed, and strength to the Spencer I'd been with throughout the winter holidays, I would have sworn he was not the same child. He smiled, squealed--still running off from many who greeted him--but he did so with a skip in his run (he doesn't take many "steps") and a welcoming grin on his face. Spencer's countenance was inarguably unprecedented for a group event. I could easily write enough for a year of blog posts with my hypotheses for this bewildering phenomenon; but suffice it to say I think it has much to do with his parents' subtle differences in mood and expectation levels--differences that I would argue are not so subtle to their young child. Those of you who know us well know that we're both wound a bit tightly. I don't hold that our every negative or ambivalent emotion is the cause of Spencer's every negative and ambivalent action. And, I'm in no way new to the idea that there exists some sort of correlation. These ideas are in no way an epiphany to me; but there was no ambivalence in the display of good will and excitement on this particular evening. Not from me, not from Jonathan, and not from Spencer. And since y'all don't come here just to hear me play psychologist, see for yourself. "Hillary, come here! I've got a plan." "Not too bad for a rookie." "I'd prefer you not catch me when I dive." It's hard to get good pictures, no matter where I moved, he was turning the other way. But, just know, behind those curls is a big smile alternating with looks of determination. Either way, he wasn't screaming. Perfect angle for maximum leverage. Abusing Creatively arranging the sofa cushions take one hundred eighty six million. "It was the best day." --Ross reminiscing about mini-muffins at work. Later, Spencer discovered a wooden recorder that was left out of his Christmas booty because his Gigi didn't think he'd be able to use it. If you've ever seen Spencer anguished in the mire of frustration, you understand the importance of not setting him up for it on a holiday past his bedtime. However, although Spencer was able to blow into the recorder and make one high, woodwind note fill the air; he was much more interested in forcing me to play it. A failure at the piano for many, many years, I can still play the rendition of "Amazing Grace" taught to my entire fifth grade class in Music on the recorder. Spencer ate it up. He wouldn't let me quit. Really. I eventually had to switch to "Hot Cross Buns" just to make it less boring for me. My mom and sister were cracking up; and it's hard to laugh and play the recorder simultaneously. Spencer had no patience for my nonsense. He will make quite the conductor someday--or merciless dictator. We're all pulling for conductor. While forcing me to play the recorder, he sashayed around the room. Again: expect the unexpected. In my naivete, I'd pictured him running through the house, blowing on the recorder as hard as he could. Glowing in his new found ability to add piercingly high sound waves to the already raucous atmosphere he enjoys creating. Wrong again. The testosterone was palpable that evening--which also may have contributed to putting Spencer at ease--and Spencer zeroed in on the one grown man who could match him bounce for bounce in both energy level and overall craziness--Steve Craig. And bounce they did. Again, to know Spencer is to know the rareness of this occurrence. He doesn't let other people with whom he is not intimately acquainted bounce him. Apparently Steve Craig ain't people. That same night Spencer spontaneously counted to four with coasters for his Gigi. And when I say, "counted to four," I expect you to know that the average person on the street would have recognized the word "three" maybe. If they'd had kids, who hadn't talked well, in the past two years--ha! He does these sorts of things best when we are attempting to ignore him. If we talk amongst ourselves, he'll approach us with a trick that he knows will get attention. If you ask, or even invite or suggest, that he do an activity of this nature--you're sure to be left high and dry. I found a great article about this "type" of kid. It was written by an SLP about (surprise surprise) another boy. She had to explain to his parents that "testing" him was not the way to get him to learn how to do things or to evaluate whether or not he was able to do them. Poor kid. I think he was three or four and his parents still hadn't figured this out about him. I could also write a year's worth of blog posts about that! But, don't worry, I won't. We celebrated Christmas with my parents, sisters, and their husbands (how in the world are we all three grown and married?) a few days early this year. Nat and Levi were heading to Witchita for Christmas, and we couldn't bear to be without them at "Christmas." Dad missed the delicious meal since he was at work paying for it; but he made it home for the opening of gifts and the labile toddler. We videotaped a lot of Spencer, so we didn't take many pictures. 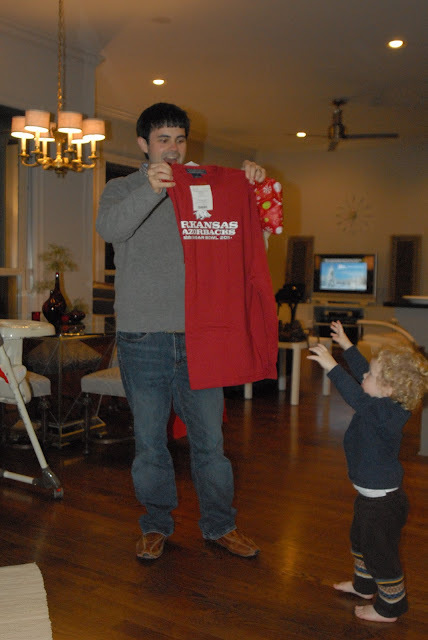 My brother-in-law graciously spent his first Christmas as an official husband-to-a-Vinsant-girl by playing photographer. Much appreciation shouted out his way. Gigi's gone all modern on us in her old age, and we love it. I remember trees she decorated all throughout my childhood. Each year she had a different "inspiration," and each year I thought it was beautiful. Each one deemed a keeper by a keeper. I don't know what we'll do when Angel goes to doggy heaven. DON'T suggest getting him one for our house. I'm terrified that I'll cave and do it; and then I'll be physically ill for the next decade (or more). Don't. let. me. buy. him. a. dog. We were trying to hold him off 'til Papa Kurt got home. He'd already plundered Gigi's bed and watched quite a few Dora's or Little Einsteins--I forget. He'd refused to eat all of the delicious food, including home made mashed potatoes. I can't wait until he's older, and I can (good-naturedly) harass him about his ridiculous eating habits. To be fair, he's had GI issues for over half of his life. But still, they're mashed potatoes for crying out loud. He was mad they weren't sweet potatoes. He got a magnetic zoo that he loved. 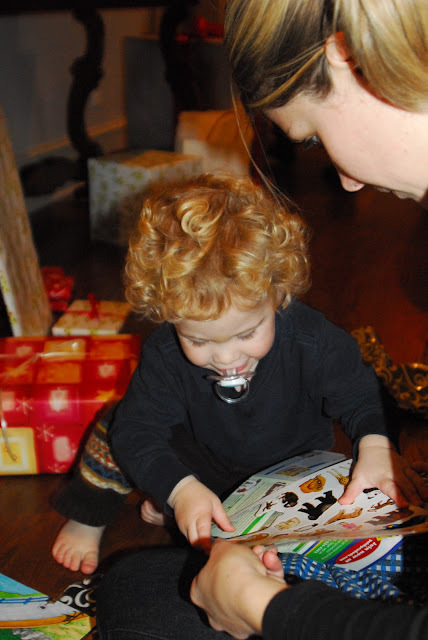 Eventually we had to convince him to go on and open another present. But only that once. He's pointing at which animal he wants me to punch out for him to stick to his magnetic zoo. He was also a big fan of the sandwich set. Are you seeing a theme? Many toys with many many pieces per toy. Asking Jonathan if he can borrow his Sugar Bowl t-shirt. At the time, it was so relaxing to do one Christmas experience a few days apart from the rest of them. We didn't have to rush home and get everything prepared to jump out of bed and do it all over again in less than twelve hours. In that way it was a refreshing change. However, this was the first year of my life to not see my immediate family on Christmas day; and I have to admit that I missed them terribly. I know for many people this is not a big deal, and for many more it's their idea of a great Christmas, ha! I kept reminding myself that we had already had our Christmas, yet I couldn't shake the feeling that it was all a little surreal--a major holiday came and went without all of us being in the same room. As I've already shared, we had a great Christmas day, it had nothing to do with that. Growing up is just hard to do. "Preh! Preh! Preh! Preh!" That means "I can't say, 'Let me open all the presents that I can see right now or I'm going to burst!' So I'm going to continue to say this same syllable over and over until you address my heartfelt concern and give me something for which the intended purpose is destruction of the outside wrapping in order to find something fun inside to be played with at a later date" for those of you who don't speak Spencenglish. His goal everywhere we went was to tear open every present. If there happened to be a gift sitting to the side because for whatever reason, that person wasn't there or couldn't open it right now, it drove him crazy. It had to be opened. No present left behind. He truly didn't seem to care much about what was inside. He didn't mind finding toys inside, but he relished tearing, ripping, and opening the boxes, bags, and packages themselves exponentially more. It was like a sport to him. And it wasn't over 'til it was over. For the most part he remained amazingly focused, but at one point he heard his Nana telling his cousin Audrey that the Calico Critters were "pigs," and he immediately spun around and went over to investigate. It was so funny. He sure loves animals. Pigs included. But don't worry, he'd gotten a toy pig that morning. I guess he was just making sure he didn't need to acquire any more livestock for his growing menagerie. I tried to assure him that we had enough pigs for the time being--plenty of animals and plenty of dust mites. He's got animals he doesn't even know exist. No one can ever say I didn't let him have pets. Our little bit of Christmas Day drama is probably best recounted during another burst of moderate to poor writing when I ought to be resting (or at least doing laundry), but I'll leave you with this apt summary as spoken by my sister Hillary, "You know it's a good Christmas when there's blood involved!" However, in the midst of it all, we received a very light dusting of sleet and snow that ever so softly accumulated on the boxes and bags I was cramming into the trunk of the car. I put one load in the car, and when I returned with the next load, I was greeted by the noise every Arkansas child knows and loves, the pitter patter of "wintry mix," and the picturesqe scene of snow-dusted Christmas excess. A few days before Christmas, I was wrestling with Spencer, and I said, "You're my big big big boy!" To which he whole-heartedly replied, "BABY!" 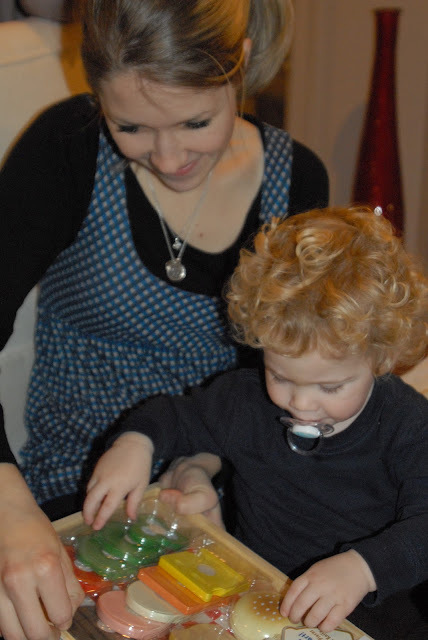 And while I know that my job as his mother is to bring him out of that mindset and to the place where he is willing, able, and ready to be an independent, autonomous self, I have to admit that little memory is certainly in the running as my favorite Christmas present. This year, Christmas was every adjective you could think of to describe Christmas--the good ones and the bad ones. I felt it coming like a steamroller, impervious to my feelings, desires, or dreams concerning what I consider to be a good, appropriate and somewhat restful Christmas for my family. I made a few last-ditch efforts in an attempt to maintain some of the sanctity of Christmas and sanity of myself only to regret those decisions to cut out and skip over people and places. All the edits without any noticeable reduction in "complication" or exhaustion levels (complicated and exhausting in a GOOD way, of course) were, in hindsight, probably not my best decision. I'm not consumed with thoughts of how it should have been or what I would have done differently, so in case you were rushing over to share your latest prescription with me, know that I did manage to cope and have successfully moved on. I'm just telling you how it was. Just because all of the Christmas fanfare rivaled that of the idea of "chaos" personified in the Old Testament, it's not to say that there weren't some wonderful, enjoyable, precious memories made. On Christmas Eve I got to meet the new born baby of one of my best friends. There's just something about those tiny, scream-y little creatures that gets your endorphins flowing. We talked and ate and oohed and aahed (while Spencer napped at home). It was at once festive and restful. It was great. That evening we took Spencer to our church's Christmas Eve service. Let's just say that I was relieved to hear that people seated around us were amused as opposed to outraged. I'm a huge proponent of children attending adult worship services, in theory. And this particular service was intended for families, including babies and screaming toddlers; but there's a fine line between a child-affirming congregation who overlooks the periodic outbursts and enjoys the wiggly, spazziness of a toddler and your impossible, thrashing two year-old who will be calmed by neither milk, nor cookies, nor coloring, nor cell phones, nor digital cameras--who can out-wrestle you while simultaneously kicking his shoes off and pulling your shirt down truly disrupting things to the point of absurdity. And that's just the part of the service when he was behaving. So after the singing and the wrestling, the screaming and the thwarted attempts at eating his candle, we headed on home. After muscling through an hour-long period of any type, you need a little sustenance; and I know no food so sustaining and delicious as my mom's Sausage Breakfast Casserole. You need to pause and just think about the deliciousness, because it's basically irreverent not to. Please don't take offense if you have served me a breakfast casserole in the past, but compared to this one all of those other ones pretty much fall into the disgusting category. Again, I'm sorry. You know I'm not a "controversial topics" blogger, but I have to stick to my guns on this one. This is the only one worth cooking or eating. So we did both. 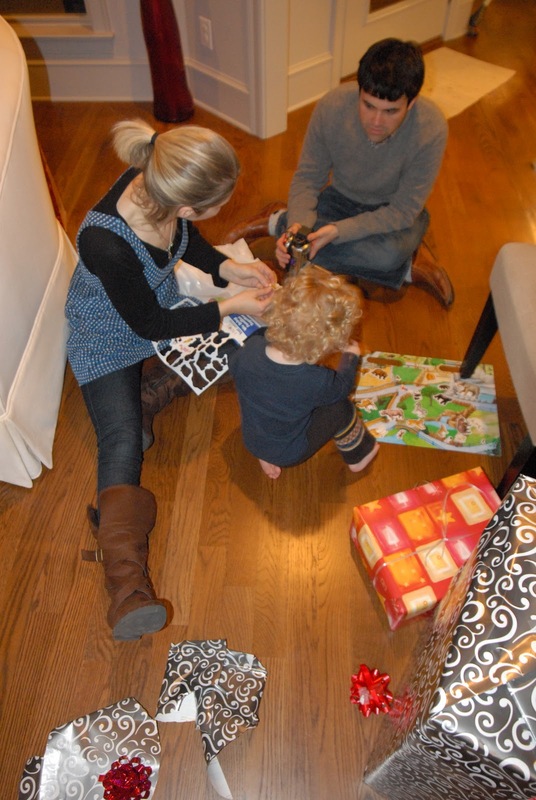 Spencer played with his grandparents, particularly drawn to the one who had announced having a cold and intending to stay away from Spencer as much as possible, with specifically mentioning the goal of staying out of his face. Since Spencer says so little right now, I still catch myself operating under the (false) assumption that he doesn't understand a lot of what the "adults" in his life are talking about--particularly when we are talking to each other. But he heard that conversation as a challenge to get as much face-time as possible from the infected grandparent. It wasn't just me who thought so. In fact, I was in the kitchen cooking and they were in the living room talking amongst themselves about how he was acting and doing things he never does in a typical evening of entertaining the grandparents. He was determined to play with the one who'd declared "no playing tonight." He got his way but got no cold, so it's a funny story. I'd settled on "Happy Birthday, Jesus" brownies as opposed to cake because we have a myriad of December birthdays in my family, and so for us cake can get over done. And who doesn't love some Christmas Eve brownies? Unfortunately, Spencer spotted those before dinner, and threw a fit every time I stopped him from climbing onto the kitchen counter to eat them. It did put a little bit of a damper on the festivities. The diversion that finally saved the day was the lighted Advent wreath candles and getting to "help" blow out the birthday candles after we sang "Happy Birthday" to Jesus. I tried to stress that we were singing to Jesus (and that Spencer wasn't Him--a life lesson for all of us). After getting though all of the red tape, we reached Spencer's favorite portion of the evening, that of eating the brownies. And if you'll simply superimpose all of that action over a none-too poetic but nonetheless entertaining and somewhat theologically edifying double feature of the Veggie Tales' "The Story of St. Nicholas" playing in the background you have a pretty accurate description of our little family's Christmas Eve 2010--that and Spencer screaming through his compulsory bath. Chapter 8: In which I realize that this chapter should encompass all noteworthy Spencer stories from September through December. I can guarantee you that my memory is not that good. That's why I try to do this every month... (Hear Pheobe saying, "That's why you have a kid!" when she learns that Ben goes to school with Sting's son). In an effort to "let it go," I'm allowing myself to focus on things I can remember from December and attempting to let go of the guilt associated with the "lost months" of months gone by sans an installment of "(Very) Short Stories." On the puzzle front, things are looking up. Spencer has acquired more patience as well as more cunning. He patiently convinces me that he needs help putting his puzzle together--cunning because I have found out of late from his Gigi that he does not, in fact, need much help at all. More than anything, I think he enjoys the company and the interaction, and I'm certainly happy to provide both. Still, there's nothing like learning that your two-year old has been tricking you into feeling needed. I have a feeling that will work in his favor for years to come. The good news is he can do his puzzles, not to mention he's excelling quite predictably in areas including emotional manipulation and feigning helplessness. While the puzzle adeptness seems to be a trait from the Kelley side primarily, the emotional manipulation comes in high amounts from all of the gene pools in question. Few things satisfy Spencer's desire to conquer and climb more these days than pulling, pushing, and throwing cushions off of upholstered furniture and using them as key components in his obstacle-course construction. A few nights ago, he was jumping from the cushion-less sofa, to the ottoman, adding a few little jumpity-jumps once on the ottoman, you know, to get his speed up, and then jumping "can-opener" style onto the bean bag on the floor in front. Fortunately for Spencer, he thoroughly enjoyed over-shooting the last jump onto the bean bag and landing heel-then-bottom on the floor. Thankfully we aren't on a slab and the hardwoods give a little. He couldn't have been more thrilled. He immediately jumped up with a huge smile on his face and determination to recreate the thrilling scenario. All this he did as his grandparents looked on in half-amusement half-paralyzing fear, hoping that the "paralyzation" part never came true. Spencer, realizing that his Gigi was constantly reaching for him throughout his living room conquests, decided to take her up on the offer. Without any warning, he careened off of the ottoman, head thrown back, arms out-streched before him, grinning from ear to ear, saying, "Giiiiiii!" Luckily, Gigi's reaction time is still decent, she got one hand under each arm pit and swung him around in a circle. Just catching him at a stand-still would have been painful for both of them, because, you know "objects in motion tend to stay in motion..." So, she wisely worked with his inertia and gradually inserted herself as the "outside force" to bring him to a state of "rest." Spencer was well-pleased with this arrangement, and convincingly threw himself off of the ottoman many more times that night to be successfully caught and delighted by his Gigi. Other days, he is happy just to remove the cushions in order to climb and slide down them. Playing in the backyard is still high on Spencer's list of great-things-to-do-at-any-time-of-the-day-or-night. And, I'll admit, I've been a little lackadaisical in my efforts to get him out there as often as he'd like. I'm not a huge fan of winter. Even when it's not that cold, it's just not as fun as being out in the spring or summer. But furniture can only take so much, and there is something about the limitless ceiling, the unlimited access to dirt and rocks, and the plentiful climbing apparatus that does a toddler good. After we'd been out for over an hour the other day, I was getting bored and allergic. So, I decided that Spencer needed to learn how to race. I told him we were going to run to the tree, and I said, "Ready, Set, Go!" (of course, he was already half-way to the tree by the time I'd said "Go!" but he was giggling all the way). He had a big ol' time, and gave the tree a big hug once we'd both arrived. I kept trying to persuade him to run from the tree on the left side of the backyard to the tree on the right side of the backyard, but he really didn't want me to leave out the tree in the middle of the backyard. So our multi-disciplinary lesson touched on a number of new principles including 1) running on "Go! ", 2) practicing the words "Ready," "Set," and "Go," 3) trying to ignore the tree in the middle of the backyard since it was not part of the "game", 4) trying to understand that games had rules and boundaries, and 5) recognizing when Mommy has gotten too bored after the obligatory hour she'd promised herself she'd play outside with you and realizing that you'd better engage in one of her new games or she'll get so bored she'll bring you inside. And, last but not least, the sixth and main lesson Spencer took away from it all was: saying and signing "More! More!" still works great so you don't really have to learn all of those other things Mommy is trying to teach you. As of late, Spencer has become an increasingly light sleeper. It may be his last couple of molars coming in or his toddler, age-appropriate desire to be the king of his own castle, but it's making my already mediocre house-keeping really nose-dive into the unacceptable category. Ever since he "learned" how to fall asleep around four months, napping and bed time have really been non-events as far as struggle is concerned. Don't get me wrong, if he's out of his routine or sick or not in his own house, he's as maverick-y as the next toddler; but generally speaking he goes down for a nap and for bedtime without ordeal. Lately, however, he'll want me to put him down as usual; but if Jonathan or I make so much as a peep, he fusses and plays--or even wakes up from a dead sleep prematurely. He has a noise maker, etc. and I (like every other mom I've consulted with) am vigilant to try to insure that he's not hot or cold, etc. At first we couldn't figure out what was "wrong" with him, but the more we sat completely still in a house completely darkened for his nap time, it became clear--he can't sleep well right now if he can hear us at all. Our house is not tiny, but it's also not carpeted, so noises do carry very well throughout. So, where I used to get him to sleep and then go along my merry little way doing things that are impossible to do when he's awake, I now sit still, avoid phone calls, and attempt to maximize my "down-time" as well as I can, while the dishes pile up, the Christmas decor clutters up the "extra" room, the bathrooms grow new layers of who-knows-what, and I feel more and more behind. We're hoping this "stage" ends, well, um, immediately. If you're wondering, yes, I was (and am) a light sleeper. Other quirky Spencer memories from these past few weeks include his newfound habit of getting a mouthful of milk and then opening his mouth really wide--you know, just to see what happens; convincing Jonathan to put the radio flyer wagon in our back flower beds (which lie at a considerable incline) and pull him around while he lays flat on his stomach; finding any piece of furniture that he is physically able to flip over, doing so, and then lounging and jumping on the bottom of it (on a good day) and ripping off or making holes in the bottom of it and storing his mom's breakable decorative objects inside (on a not as good day); willingly going places with his dad without his mom without crying; taking off his clothes when he sees fit (sometimes getting stuck in his shirts as a result), pointing at letters wherever he sees them and saying "E!" and "O! "; and brightening our short, often dark, winter days. One night, eleven years ago, I was on the floor of my closet crying in the fetal position. Between work, dance, Fine Arts, the school play, and Trigonometry--I was at the end of myself. That and I kept offering to help everyone with their English Lit research papers. And from that night forward, I've never been over-committed again. Really. It cured me for life. Now, I've been severely under-committed often since then. And, lazy as that may seem, it's all part of my promise to myself to never be that crazy again--at least not because of extra things I've signed up for! So, compared to many of you who have full-time (or even part-time) jobs, families, exercise programs, weekly date nights, organic, home-cooked, frozen meals for 3 months, church responsibilities, hair appointments every 2 months, and time to read blogs I may appear to be a lazy or at least under-motivated person. However, the complete inverse is true. I am a highly motivated person. I am highly motivated to doing the best I can; and this is just how I have to do it. My latest decision to be under-committed was made during our holiday break. I sent an email to my Bible study leader (whose endearing fun, warm personality made the decision even harder) telling her I wouldn't be back for the Winter/Spring semester. Tomorrow's the big night! =) Jonathan will be rooting for the Hogs at my parent's house (so he can watch it in HD on the big screen), and I'll be home putting Spencer to bed (ha!) but ALSO rooting for the Hogs! I have really struggled with this decision all month, because it's hard for me to think that the "right" thing to do is to drop Bible Study. Having had no brothers of my own, I have been trying to understand little boys for quite a while now, I was a nanny for a little over a year when we lived in North Carolina, and I read as many books as I could to better understand Ryan, the sweet (yet puzzling!) 3.5 year old that I took care of. I read "Why Gender Matters" by Leonard Sax and loved it. It's fascinating. During the break I read another one of Dr. Sax's books called "Boys Adrift." (By the way, I think you'd really enjoy reading both of the books since you have boys of your own--it's not just about "little" boys). I was again struck with how different their needs are from that of girls; and it helped re-affirm to me that Spencer (at this point) truly needs to be running and climbing. In the summer, it is SO easy to accomplish this with him--open the door, turn on the hose--and we are good for HOURS. However, in the winter, every day is a challenge to not lose our minds--couch cushions yanked off both sofas and pointing almost straight up in the air to mimic climbing walls and slides--I know that you know exactly what I'm talking about. Speaking of talking, that's one area in which Spencer is not currently excelling. So, nothing is set in stone yet, but it looks like we'll be doing a little Speech Therapy--another thing to add to the weekly schedule. I know that MANY people have MANY children with MANY more needs, classes, and "issues" than I have to juggle with Spencer; but I also know that everyone has their own set of limitations. I just so happen to have a lot of limitations =) I need a lot of sleep, and I need a lot of "down time" to be even a decent wife and mom. God bless you if you actually read all of that. I'm truly bummed because although I made it to BIble Study only a few times last semester, I really loved having you as my leader, and I loved all the ladies in our group. I know that being a CBS leader is a huge commitment, and I want to thank you so much for all of your prayers and phone calls and everything else that is behind the scenes. I'll try to answer your call for next week so we can at least chat a little bit. I don't know that being under-committed is any healthier than being over-committed. I'm pretty sure there's a balance that I struggle to find. What I do know is how I start to feel when, for whatever reason, my margins* are being encroached upon. And, I know what to do--quit stuff immediately!--or end up on the floor of my closet crying in the fetal position. And, I like to avoid that whenever possible. *Another book I enjoyed years ago as I learned this about myself--"Margin" by Richard Swenson.